People today who need to figure out the best way to remove a stain from a carpet or cure a case of hiccups need only consult the many oracles of the Internet to find a variety of solutions. Well-born ladies of an earlier age lacked such an advanced resource, but they did have access to the wisdom passed down through Household Books. These books were carefully gathered collections of the best remedies, recipes, advice and suggestions that 18th century society ladies shared with one another. 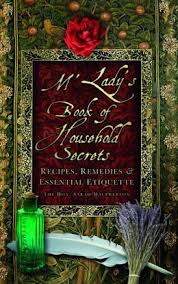 The beautiful and fascinating new book M'Lady's Book of Household Secrets: Recipes, Remedies and Essential Etiquette compiles some of these collections of historical wisdom into one volume. The information contained in this book comes from two books kept by real aristocratic ladies: Lady Talbot of Lacock Abbey and Lady Louisa Conolly of Castletown House. There is also a section describing the duties that servants were expected to carry out in the stately Weddington Castle (as well as useful guidelines as to suitable ages for each position). Author Sarah Macpherson also includes some beautiful color illustrations of plants and handwritten notes that were included in the original documents. The book is divided into chapters covering Herbal Remedies (and their preparations), Household Maintenance, M'Lady's Garden, Servants, and Food and Cookery. The Herbal Remedies section contaisns recipes and instructions for relieving a variety of ailments such as dropsy, insomnia and depression. There are also remedies for more delicate problems, such as overcoming shyness or "removing inhibitions." Many of the ingredients for the potions would be easily found in the garden (although they might require labor-intensive chopping, infusing and straining before they were ready to be used), but I do wonder how people without a Boots (or Walgreens for us in the US) on every corner obtained such exotic-sounding ingredients as myrrh, avocado oil and ambergris. Many of the suggestions would be useful today, but there are some chores that have thankfully been lost to the passage of time -- such as the instruction on how to clean armour, including helpful hints on how to remove stubborn swords from their sheaths. I've never had much luck as a gardener, but perhaps I've discovered a clue as to why that is. The section on M'Lady's Garden includes the following warning on planting herbs: "Do not use the left hand, or the devil's work will ensue, for herbs have mystical properties." So that's the problem! This section also includes very prettily drawn layouts for herb gardens, including a suggestion of all the herbs that the well-stocked kitchen would have needed. There is also a section describing what herbs and vegetables should be planted together, both to improve flavors of each and to discourage pests. Many of the recipes in the food section sound delicious and I might give the Pea Soup and the Herb Omelette a try. The Stewed Carp, with its somewhat alarming ingredient of gently simmered "blood of carp" might best be left to the dusty cookbooks of history, though! The book is lavishly illustrated throughout with beautiful black and white drawings, in addition to the colorful plates in the middle of the book. I really enjoyed this peek into the daily domestic lives of 18th century ladies. Much of the advice in the book would still be useful today, I'm sure, if anyone wanted to invest the time into gathering and creating the preparations!